Sean Dyche feels his squad have got the stomach to take on whatever challenges lie ahead in the top flight. The Clarets suffered a 10th away defeat of the season against Watford at Vicarage Road, a stark contrast to the nine wins accumulated at Turf Moor, leading to claims that the players may be suffering psychologically. But the Burnley boss dismissed those accusations, adding that the display against the Hornets went a long way to highlighting his side’s strength of character. “There’s no baggage from this away thing,” he said. “There could be a load of baggage from that but there’s none. “We’re in the Premier League, it’s not easy to be rolling round the Premier League winning games away from home. “We just go ‘yeah okay, that’s the challenge’. We haven’t won a game away? So what. Let’s go and take on the next one. On the club’s 100th outing in the Premier League the Clarets were required to showcase every facet of their personality to overcome a numerical disadvantage, following Jeff Hendrick’s sending off, and a two-goal deficit. And they stood tall to the task, fighting tooth and nail for the cause, as they fell just short with a dominant second half display. 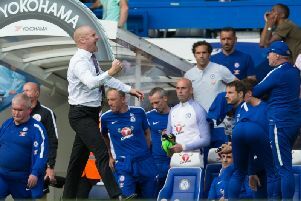 After a fourth successive 2-1 loss on the road, Dyche said: “I don’t usually overpraise the side but I thought they were fantastic, particularly second half. “To get the early blow of having a man sent-off and then the blow of a second goal just before half time our mentality to see through that and still take the game on to try and win it was absolutely outstanding. “We made enough to probably nick something out of it. I thought we gave everything to do that and I’m absolutely delighted with my players. I have a team who give every inch of themselves to win a game and that was on show. Four of Burnley’s next five games in the league are away from home, with Hull City, Swansea City, Liverpool and Sunderland on the horizon, and Dyche is confident that recent performances are building towards that breakthrough. “The last four and a half away games, with the second half at West Ham, we’ve been really good, I’ve been really happy with the performances and I was today,” he said. “I thought second half, if we keep playing like that with 11, you’ve got to think you’ve got a good chance if you keep delivering performances like that. “Performances are always a marker for me and I wouldn’t knock my players today. It’s a tough challenge 10 versus 11 anyway, particularly after you’re an early goal down after going down to 10 and then one before half-time. Deadline day signings Robbie Brady and Ashley Westwood were handed their debuts during the loss in Hertfordshire and Dyche was pleased with the pair’s contributions. “I thought they came on and affected the game,” he said. “Westy has got real good, quick thought on the pitch, quick awareness, he gets it down and plays quickly, finds good passes. “Robbie with his desire to affect the game and his running power, and his set-pieces as well. A nice little start for both of them. “His set-pieces were right on the money. We didn’t buy him for that, but it’s a nice thing to have when you can take set-pieces like that. “I like my players to work with us first before they come into the side which is why I didn’t start them.